If you need to contact me for any reason, please use the email address given below ... I'll respond as soon as I reasonably can. 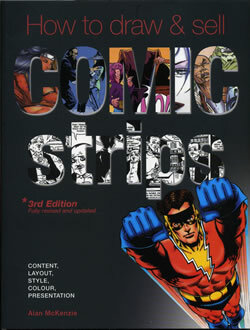 << How to Draw and Sell Comic Strips (Third Edition) is an update of the 1987 original, which contains completely revised material and extensive information of the digital revolution that's taken place in the comic industry over the last ten years. If you've ever wondered "how they do that?" when it comes to writing, drawing, colouring or lettering comic strips for professional publication, look no further than this book. With contributions from artists Steve Parkhouse, Dave Gibbons and a wealth of examples from comics both British and American, How to Draw and Sell Comics is the definitive guide for any aspiring comic strip artist.